To reduce the workload with setting up the new Dell Vostro 470 PCs that were purchased I decided to build one and then clone it to the other seven using Clonezilla. I chose Clonezilla because I had plenty of experience with it and 8 PCs was too many to build one by one but not enough to make it worthwhile to the Microsoft Deployment Toolkit (MDT). The build process involved setting up the PC, deleting all the cruft that came with the PC that we didn’t require and then installing all the standard software that we had volume licences for, not Microsoft Office 2013 unfortunately as we purchased the Home and Business version without a volume license (this meant I had to register 35 licences myself to a new Microsoft account in the name of Activus IT Support). Once the PC was built in order to clone it to the others I needed to create an image and this meant booting from the Clonezilla CD, and the CD drive as is typical is not the primary device in the boot process. In previous versions of Windows this was a trivially easy task to change as it just required hitting F2 or Esc as the computer booted to access the BIOS and then change the appropriate settings on the boot screen. Windows 8 however is a more complicated beast in this respect and accessing the ‘BIOS’ isn’t as simple as hitting a key as the PC boots. Instead you need to boot all the way into Windows and then instruct it to change it’s behaviour the next time it boots so you can access the UEFI settings. 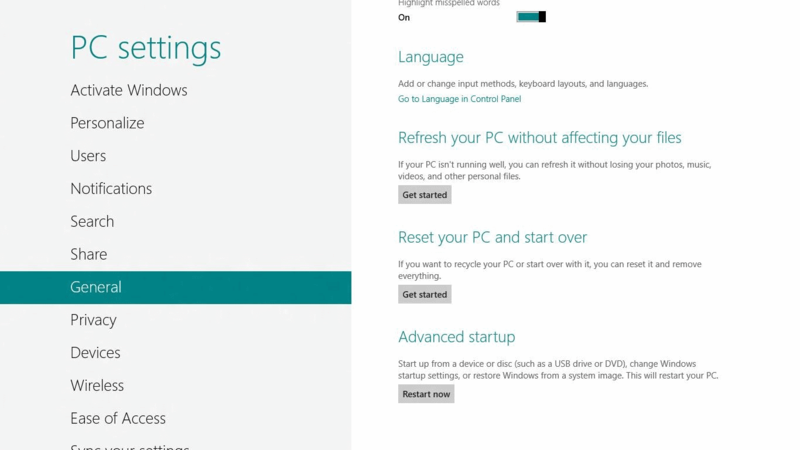 Firstly from the Settings menu select Advanced startup. Would be tempting to choose the option Use a device here and then boot from the Clonezilla CD, however it will fail to boot because of the Secure Boot feature. This feature is designed to prevent the loading of drivers or OS loaders that are not signed with an acceptable digital signature and Clonezilla lacks that digital signature. Choose Troubleshoot and then UEFI Firmware Settings from the Advanced options screen. Having accessed the UEFI remember that it isn’t just a case of changing the primary boot device to the CD-ROM drive you must also turn off Secure Boot. Having done all that I was finally able to create the image from the disk. Reboot and you’ll be greeted with the following message as Windows 8 requires UEFI and Secure Boot to be enabled again. Instead you need to hit F2 to enter setup and change the boot settings back to how they were. 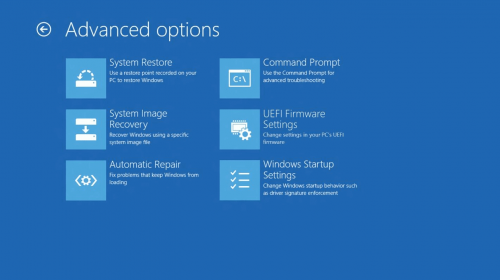 Change the Boot Mode back to UEFI and then Enable Secure Boot again. 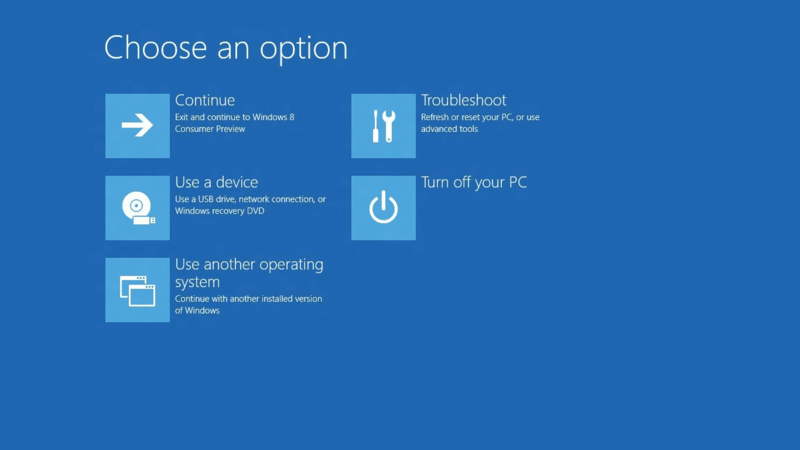 Save and Exit and Windows 8 will then boot correctly. As an aside I just discovered I can launch the command prompt from the start screen just by typing cmd (a lot easier than navigating to it using a mouse in the Windows 8 interface). Don’t even need to launch the Run dialog box to run basic commands such as ping!